This is the second of a three-part series on how to paint lively wildlife representations in watercolour. In last month’s issue we began with the brushstroke and the overall shape, adding colour, wet into wet. This month we add surface detail, discuss warm and cool blues, and observe light and shadow. 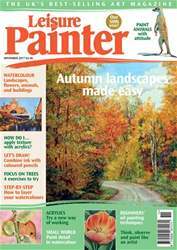 Time to take out your brushes and colours as you peruse the November issue of Leisure Painter. This month, build your confidence and skill set with new ideas from acrylic painters, Brendan Smith and Helen Elliott. For the watercolourists, there are demonstrations and practical advice for painting flowers, autumn landscapes, trees, animals, buildings and street scenes. Oil painter, Martin Kinnear covers 'how to paint a winner' with advice on how to see and think like a professional artist, while Elena Parashko demonstrates the painting of tulips in the same medium. Tony Paul continues his look at successful composition ideas, Tim Fisher (who completes his seven-part line & colour series this month) also reports on new sketching sets by Caran d'Ache, and there's even an article on how to paint a halloween-inspired cartoon. Enjoy another month of painting with the UK's best-selling learn to paint magazine.